It's been a couple months since my last comparison and my recent @essieclubcollab was based on the colour coral so I drew inspiration from my club and VOILA! We have today's post. Except the thing we learned while preparing for the collage was that there is a vast difference between corals. 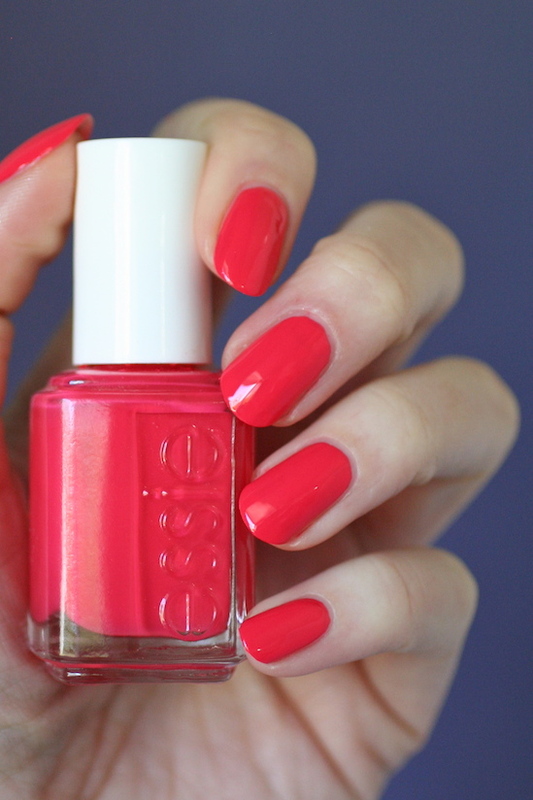 A coral is described as "a pink or reddish orange", but that orange can range from dark orange to pale peach and everything in between so there are SOOOO many Essie corals! When I decided to do a coral comparison, I pulled all of mine out and I had TWENTY BOTTLES OF CORAL POLISH. The biggest comparison I've done is 9 polishes at once, but 20 is out of control, so I'm going to break them up into groups and compare them that way. I have a group of orange corals, some pink corals and todays post is with the more red corals. So let's get into it! I borrowed this polish from my friend Tina. She's all about the coral polishes so I bought her this Gel Couture for Christmas. I knew she already had some orange corals and red corals and I like how this one leans more pink. It's the lightest and most pink out of these polishes but also has those orange-coral undertones making it not a straight up pink. The formula is great and Signature Smile applies so nicely. At 2 coats I felt like I could still see my nail line and a bit of unevenness so I went ahead and did 3 coats but you could totally get away with 2 if you wanted and weren't that picky. It wasn't super noticeable in real life but it is noticeable when I take a picture close up with my macro lens. I'm digging this one because the lighter pink tones in it look really nice on my skin tone. This is a core Gel Couture polish and would be easy to find anywhere. 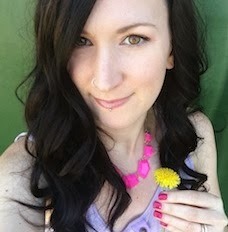 I love Cute As A Button! This is a favourite coral in my collection. I was given it as a baby gift in the hospital after giving birth to my daughter Arya. It has an easy to apply formula in 2 coats. Nice and self-leveling. The polish came out in the 2009 Summer Collection called "I Dream in Color" along with faves like Lovie Dovie and Not Just a Pretty Face, but it was added to the permanent collection. You could get this in any drugstore or order online. This one is really close to Cute As A Button but leans more orange. It also has very fine shimmer running throughout it. To accommodate all the shimmer and have it actually show up on the nail, this polish has more of a crelly formula. It applies nice and self-levels well but you can still see your nail line at 2 coats. It's even and not streaky though which is nice. I did 3 coats but you can still faintly see the nail line. I think this polish would work great as a jelly sandwich mani. Sunday Funday came out in the 2013 Summer Collection called "Naughty Nautical" but this too was added to the permanent collection. I don't tend to see this one in drugstores around here, but you may find it in yours. It's easy to find online though. 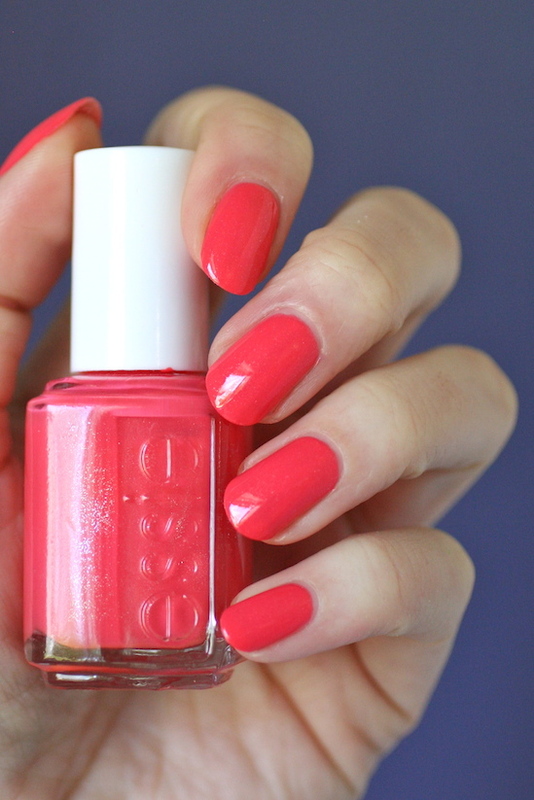 This is a coral that leans more to the side of red but with some definite pink undertones as well. Nice formula again. Pretty much the same as the other ones where its a super nice, smooth easy to apply formula but you can still see the nail line on 2 coats. I went with 3. 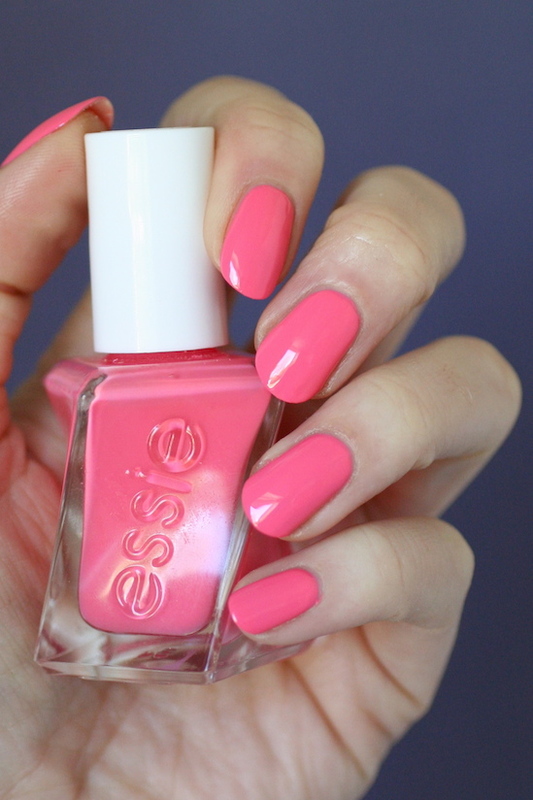 This polish must've been released in the early Essie days back in the 80's because it's number is 076. It's still in the permanent collection and can be found pretty much anywhere. I bought mine in Walmart but you can also order it online . 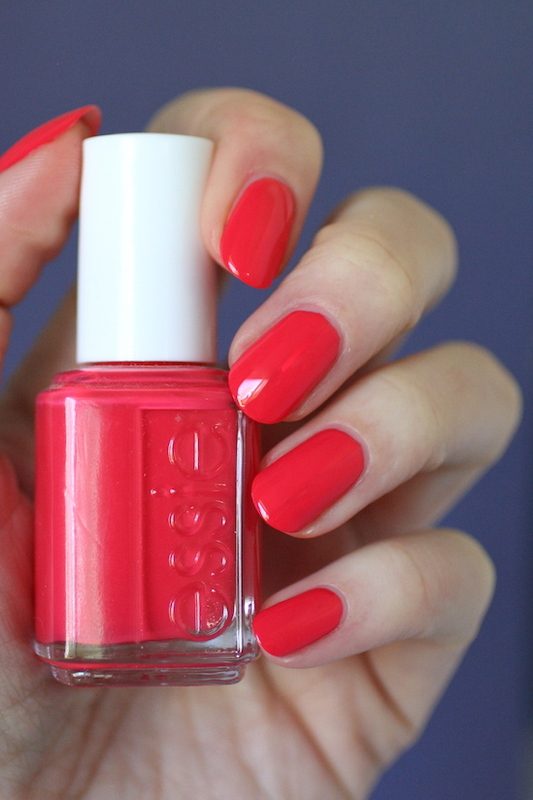 This is such a pretty bright red coral (it almost has the look of neon) and is one of my all-time fave Essie's. Great formula and opaque in 2 easy coats. Come Here came out in the 2013 Resort Collection but I'm pretty sure it was also added to the permanent collection but it's harder to find in stores. You'll most likely have to find this one online. Sunset Sneaks has the exact same easy formula and is opaque in 2 coats and self-levels well. This polish came out in the Summer 2015 Peach Side Babe Collection. Back then I said that Sunset Sneaks and Come Here were dupes. And honestly, they totally are. I'm looking at the swatch wheel of them side by side right now and I can't tell them apart. If you want me to be picky I think Sunset Sneaks leans the very slightest bit more orange. But hardly. Like a minuscule amount. And maybe only if the polish is wet. Once they are dry they are identical. If you own one, you don't need the other. Or if you can find Come Here but not Sunset Sneaks (which was discontinued) just get Come Here and you'll have the same shade of polish. Here they all are side by side. I've mentioned before that my camera has a hard time picking up the subtle differences between these kinds of shades but I'm starting to think it's my computer screen. When I viewed my Resort 2017 post on my phone, all the bright red and orange shades that looked the same on my computer screen showed the subtle differences on my phone. So I dunno. I'll point out the differences to you anyways. We can all see that Signature Smile is the most pink, but Cute As A Button also has a strong pink tone. Sunday Funday and Cute As A Button are close but Sunday Funday actually looks more orange. To be honest, my computer screen is showing me that Sunday Funday, Peach Daiquiri, Come Here and Sunset Sneaks are all the same shade, but Sunday Funday is definitely more orange than all of them in real life. 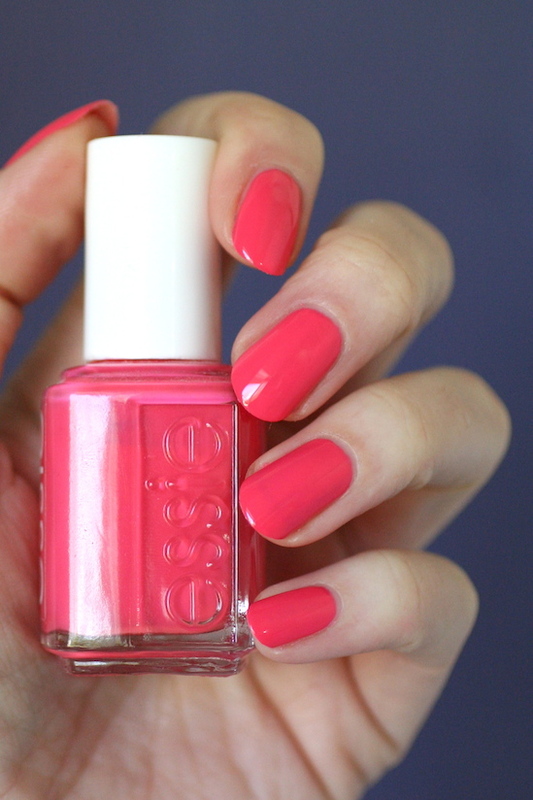 Peach Daiquiri has very strong pink tones to it, but it's a deeper colour than Cute As A Button. It's more pink than Come Here and Sunset Sneaks. Come Here and Sunset Sneaks are on the red side with those pink/orange coral undertones. The photo shows them as dupes and that's not a lie. I took this swatch wheel into bright sunshine and in the shade and back into indoor lighting and they always look the exact same. Dupey dupe dupes. 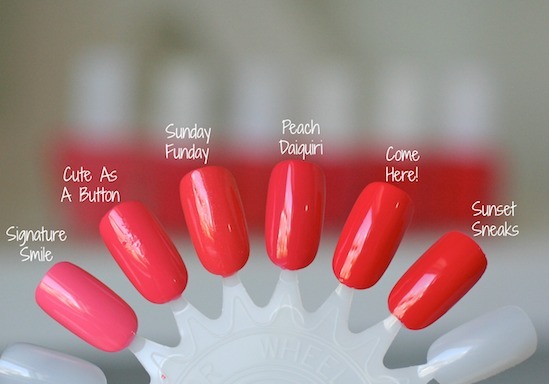 But Cute As a Button, Sunday Funday and Peach Daiquiri are NOT dupes (and Peach Daiquiri is not a dupe for Come Here/Sunset Sneaks). This photo of all the shades swatched separately and then placed side by side actually shows them more accurately (except I would say that Sunday Funday still leans more orange in real life). I always pick a fave polish at the end of these comparisons but I'm finding that a little hard to do. You already know I love Come Here. It's my favourite red to wear in the Summer months. But pretty much any of the more pink corals I liked on my skin tone. Signature Smile, Cute As A Button, Peach Daiquiri...all beautiful. Oh great. Now I'm going to have another polish on my wish list since I don't own Signature Smile! These all had great formulas though, so you can't go wrong with any of them. 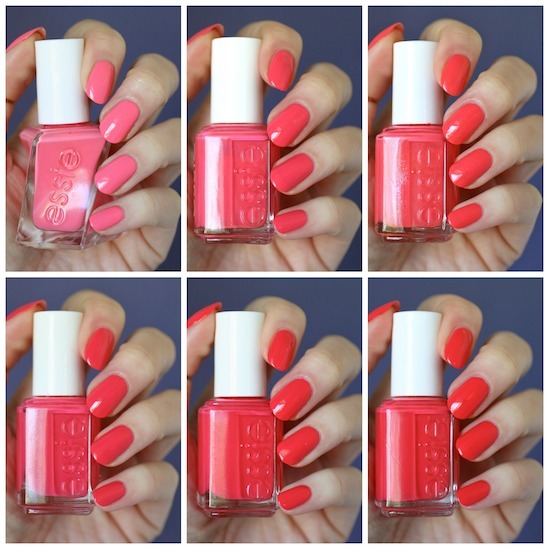 What's your favourite polish to wear out of these 6 red corals? I hope you found this helpful! I've got lots more corals to compare, so I'm going to get to work and start swatching them for you. Some polishes may overlap categories like Sunday Funday; it fit well with this red coral comparison because it was the same tone as the other polishes, but it will also work well swatching it next to the other orange corals. I'll keep using the same blue background and maybe even put together one big 20 coral polish collage at the end of it. 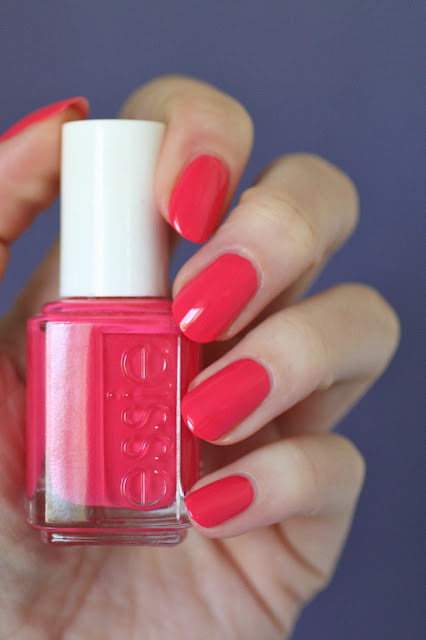 Any Essie corals that you are itching to see compared? Leave your suggestions in the comments! 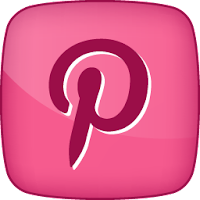 To see the Peachy-Pink Coral Comparison go HERE. To see the Orange Coral Comparison go HERE. I have both signature smile and cute as a button in my collection. Out of these two I would say signature smile is my favourite. You should definitely get signature smile, I love to wear this one in the summer. I have Van D'Go, Stones n Roses, and Lounge Lover in my lineup to use in the next month. Do you consider those corals? Will they + Tart Deco, and My Chihuahua Bites be part of your next posts? Yeah I think I might need it Shimmering Highlights! Letsgetlost : Good choice going with Cute As A Button! If you don't love Funday Sunday it could just be the orange undertone throwing you off. I love Cute As A Button! Yes, all those polishes will be in my next comparison! (Except for the OPI one). 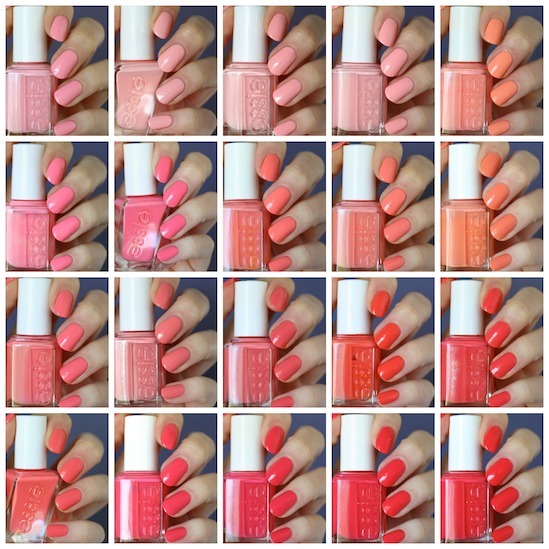 If you go to the Essie website and type in "coral" all those polishes come up. That's why there are SOOOO many because colors like Van D'Go and Come Here are both considered corals! (And that's a huge spectrum) I'm working on the post for the more peachy-pink toned corals right now. Great post! I think I have to get Signature Smile too! Corals are my favorite, I could wear them on constant rotation! Funny because my Sunday Funday regular polish and the gel version I have are more peachy. Same with Peach Daiquiri it's more peachy pink.